Live The Life should need little introduction. It is the bestselling Christian youth book of recent years, having sold over 12,000 copies in just over two years. Ecbj said* 'Having lamented the absence of a plain speaking life manual for young people, both as a parent, pastor and youth worker, it is good to announce* this is it!' Now Mike Pilavachi and Craig Borlase have fully revised the text, keeping it as up to date as possible with the fast-changing pace of youth culture. 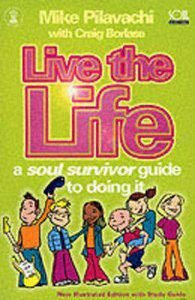 As well as a 'study guide-style' life application section at the end of each chapter, the text has been enhanced with the addition of brilliant cartoons by Andi Cantellow-Smith, well-known for his work on Soul Sista and with the World Wide Message Tribe. - Publisher Live the Life provides an anchor for young people and teenagers trying to live a Christian life away from churches, staged events and normal fellowship. The authors deal with issues ranging from drugs and depression to family life and work. Live the Life provides an anchor for young people and teenagers trying to live a Christian life away from churches, staged events and normal fellowship. The authors deal with issues ranging from drugs and depression to family life and work.